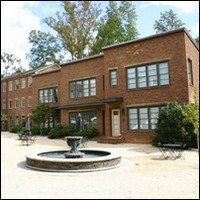 Serenbe Playhouse embraces the existing architecture and nature of the Serenbe Community to create unique performance spaces for each production. From the Serenbe stables to The Inn, each location is transformed into a one-of-a-kind stage, enhancing the performance experience. Parking: Serenbe is a 1,000-acre community located less than 30 minutes from Atlanta’s Hartsfield-Jackson International Airport. Free street parking is readily available.